It is important when ordering spare parts that they are identified correctly first time for quick service. 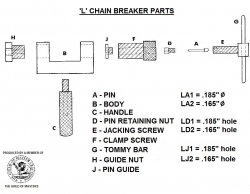 The above diagram is enclosed as a leaflet with each chain breaker supplied. 2. The second letter identifies the part as per the drawing. 3. The number denotes the pin size when applicable. As an example if you required a new jacking screw the part required would be LE. If you required a large pin 0.150" dia the part required would be an LA1.